As a new mom, I chose to bottle feed. The decision was very personal and I was aware of the pros and cons of my choice. After my son began to outgrow the ready to feed bottles he got at the hospital, mixing formula became tedious and inconvenient, especially in the middle of the night. 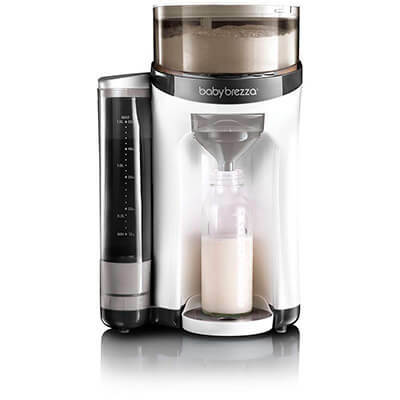 One of my girlfriends told me about the Baby Brezza Formula Pro and how it could possibly make things easier, so I checked it out. Baby Brezza Formula Pro’s claim is that when you use it, you get a perfect bottle every time. Perfectly mixed, perfectly heated, perfectly proportioned. I used this item for about four months before selling it. Here are some pros and cons that I want to share in case you are considering purchasing one as well. It makes a bottle quickly. I could count to five and the bottle would be ready to go! It measures the powder out well. You can choose to make a 2, 4, 6, or 8 ounce bottle. The water reservoir holds a good amount of water. I only had to fill it a few times a day. You don’t have to do any shaking. The formula and water dispense at the same time and the bottle is nice and smooth for the baby. It’s fairly portable if you need to take it with you on a trip or family visit. Directions are provided clearly with step by step pictures. A formula chart is provided so you know which setting the machine needs to be placed on depending on formula used. You have to keep it on constantly. Yes, you get a quick bottle but the machine has to be completely warmed up to do so. Warming up takes about five minutes and when you have a screaming baby, waiting patiently can be difficult. It will make a bottle if it’s not warmed up but it will not be warm at all. I turned it off whenever I left the house and between one of my son’s night feedings. Other than that, the machine was on all day. It can be tricky to put together. You really have to pay attention to the directions when you assemble it. It doesn’t come with many parts, but they have to sit and snap perfectly in order to work well. I noticed one day that the formula was coming out clumpy and it made the bottle gooey. I had to take all the powder out of the top (which is not a fun task) and examine each part. One of the parts was not sitting under the tab where it needed to be and it was pulling down too much powder. Once I fixed the issue, the problem was solved, but I wasted a lot of powder. You have to wash it daily and weekly. I noticed that if I didn’t clean out the tip where the formula was poured from daily, residue got left behind and because it was moist; it hardened. This restricted the formula from pouring out cleanly and precisely. The manual also suggested cleaning all the parts weekly in order to maintain cleanliness and function. As I said in con #2, taking it apart is not a fun task. It only mixes certain kinds of formula well. My son needed to be placed on a specialized formula for acid reflux. I noticed that the machine had difficulty mixing it and distributing it. I called the product’s hotline help number, and the associate admitted the machine was not great for specialized powders because they are extra thick. This ultimately led me to sell the machine. Overall, I liked this baby food maker and found it useful when my son was not on his specialized powder. Once he needed that though, the machine became a chore and was not working as well as I’d like. My advice is to purchase one used so you do not pay a small fortune in case you end up not needing it like I did in the long run.